How to avoid medical malpractice during transition of care? Medical Malpractice has a higher risk of occurring when a patient transfers between various treatment sites and caregivers even within the same institution. A well coordinated transition between various healthcare settings can reduce the risk of medical errors, decrease hospital re-admission rates, avoid the duplication of services and reduce the waste of resources. Family Caregiver Guide to Doctor Visits (United Hospital Fund). Family members sometimes disagree about what subject to discuss during the doctor visit. Sometimes they are too shy to ask questions or embarrassed to bring up specific subjects in front of the patient or other family members. Sometimes family caregivers don’t listen properly and when back home get confused about the treatment or forget to schedule other appointments with different physicians. This guide explains how to resolves these types of conflicts and how family caregivers can make the best of the doctor visit so unnecessary harm to patients can be prevented. Hospital-to-Home Discharge Guide (United Hospital Fund). 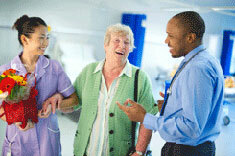 When a patient is discharged from the hospital, family members become the care providers for the patient. This guide helps family caregivers prepare for the arrival of the patient and make sure they are able to provide the care that the patient needs. The guide also provides useful information on how to appeal a hospital discharge decision if family caregivers feel the hospital discharge plan is not safe for the patient. Transitions of Care in the Long-Term Care Continuum (American Medical Directors Association). Patients in the long term care continuum often need to be transferred from one care setting to another. For example a resident from a senior apartment complex needs to be transferred to the ER. From the ER the patient is then transferred to a hospital setting and then subsequently transferred to an assisted living community because he or she is now unable to live independently. Adverse events related to medication errors and other preventable medical complications often happen during these transitions because of poor communication between healthcare providers. This article provides guidelines to healthcare providers to avoid this type of medical malpractice. Transitional Care Management 30-Day Worksheet (American Academy of Family Physicians). This excellent worksheet gathers all patient information required during transitional care, reducing the risk of medical error. To avoid medical malpractice every healthcare practitioner should use this check list to implement and measure the transition of care handover process.